Major League Baseball tickets can be pricey, but that doesn’t mean you have to blow your summer savings trying to catch a game. Here are the top five ways to save money on baseball tickets this summer. Baseball games that fall on a Friday and Saturday are typically the priciest, with Saturday being the most expensive. According to SeatGeek data, Tuesday and Wednesday games often offer the best deals. If your schedule allows, heading to a Wednesday game will save you the most money. When spending hard-earned cash on baseball tickets, its important to make sure you’re getting your money’s worth. 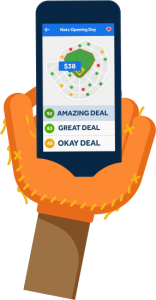 Deal Score is a tool developed by SeatGeek to help rank the value of a ticket based on historical prices for the team and venue, the row location, the expected sightline from the section, and the quality of the other available tickets for the event. Utilizing this feature will ensure that you’re getting the most bang-for-your-buck when shopping. When purchasing MLB tickets, consider that the three teams driving the most ticket demand on the road are the New York Yankees, Boston Red Sox and Los Angeles Dodgers. And if any of those are your teams–our apologies. On average, MLB fans pay 38 percent less when they buy the week of a game versus a month or more ahead of time. However, there are caveats. If it’s a popular game there might be less inventory available, so finding your perfect seat could be harder. Waiting until the last minute to buy is a great option for folks traveling solo or in a small group, but if you’re looking for tickets for a large group or an odd number of people, it might be better to buy sooner. Of course it’s more exciting to see your favorite team on their local turf, but opting for an away game can save you some serious cash. Comparison shop to find out what cities offer the most value. And who doesn’t want a good excuse to take a trip? Get MLB ticket deals straight to your inbox.